A blend with a consistent crema and a strong and decisive character, with a pleasant after taste of dry fruits, bitter cocoa and precious woods that remind you of a fine barrel - aged wine. Lavazza Crema e Aroma espresso coffee beans produce a rich and lively, creamy coffee with an intense aroma. 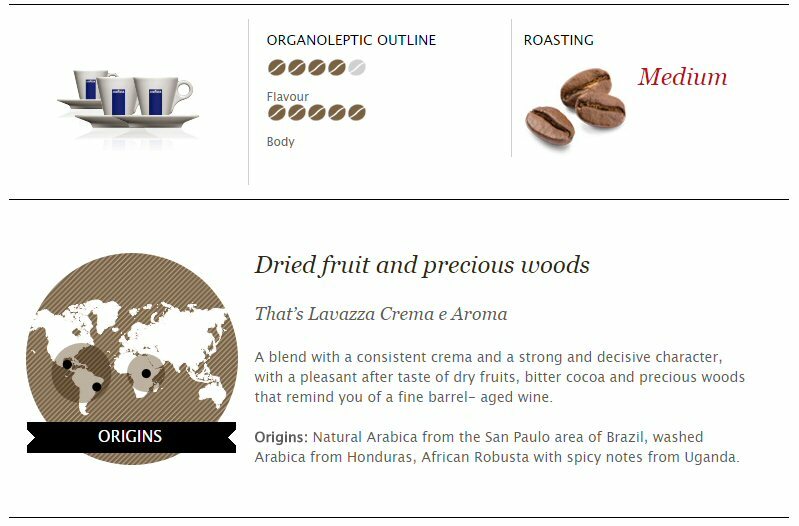 Blended using the finest Arabica coffee beans from South America, together with African and Indian robustas, this great Lavazza crema aroma coffee has a full-bodied flavour, making it ideal for drinking at any time of the day. It's particularly well suited for use in cappuccinos and lattes as it retains its strength and full body even when used with lots of milk.